Solvency and asset quality have improved over the last year, as have business fundamentals and efficiency and recurring net income before provisions deriving from higher net interest income and lower administrative expenses. As a cooperative bank, the Group retains control over profits and focuses on strengthening its operations and channelling social investments to its partners and customers. Performing loans to customers are up 4.1%, 87% of which has been lent to the agri-food sector and enterprises. This has seen the Group continue growing its share of the Spanish market in the agri-food sector, which now stands at 14.05%. Retail funds under management have grown by 9.1% to €32.792 billion, driven by increases in demand deposits of 15.7% and in off-balance sheet funds of 4%. The quality of the balance sheet has improved year-on-year thanks to a fall in problem assets, deriving from a 26.8% decrease in doubtful loans and receivables, while the NPL ratio has shrank 2.90 pp to 7.63%. There has also been a decline in the volume of non-performing assets, with a 10% decrease in gross foreclosed assets. The total capital ratio has improved to 14.25% while the CET1 ratio is 12.52% (phase-in) and 11.54% (fully loaded). This is comfortably above the supervisor’s requirements, as a result of bolstering eligible capital by 7.8% and paring back risk-weighted assets (RWAs) by 3.7%. The cost-income ratio has improved 2.2 pp to 60.63%, assisted by the 7.83% reduction in operating expenses as a result of optimising the commercial network, the digital transformation, the write-down of intangible assets, and the increase in recurring gross income. Efforts to boost customer loyalty and the digitalisation process continue apace. As a result, 44% of the Group’s 3.4 million customers are now classed as loyal, while 47% of these are digital users. Grupo Cooperativo Cajamar – the leading cooperative bank in the country – has continued to grow its share of the market for lending to the agri-food sector and enterprises. It has also attracted a greater amount of retail customers’ savings, while furthering its investments to support the development of its local community and contribute to creating value for the business community, the self-employed and families. It has simultaneously bolstered its solvency and improved the quality of its balance sheet, giving its business model a boost and building a springboard for future organic growth. Total assets grew by 9.8% year-on-year to €44.079 billion, while the total funds under management climbed to €73.859 billion – up 4.3%. Performing loans to customers are up 4.1% to €28.818 billion, 87% of which has been lent to the agri-food sector and businesses in 2018. The Group now boasts a share of the Spanish market of 14.05%, supported by its large range of specialised products and services and the experience of its advisors and Agri-food Innovation team. Retail funds under management have grown by 9.1% to €32.792 billion, driven by increases in demand deposits of 15.7% and in off-balance sheet funds of 4%, the latter including mutual funds, savings insurance, pension plans and fixed-income and equity products. The agreement with Generali to drive growth of the insurance and pension plan business has led to premium increases of 18.9% for life risk insurance, 17.6% for property & casualty insurance, and 3.1% for pension plans contracts. Assets under management in mutual funds are also up 8.9%, despite instability in the markets at the back end of the year. The number of new consumer loans granted through Cajamar Consumo (a joint venture with Cetelem) is also 26.7% higher. In 2018, Grupo Cooperativo Cajamar posted a consolidated net profit of €82.25 million, 2.7 % higher year-on-year, fuelled by a 3.8% increase in recurring gross income and a reduction in personnel expenses and other general administrative expenses of 6.1% and 3.3%, respectively. This led to recurring net income before provisions shooting up by 32.9%. The increase in net interest income to €568 million (+6.9%) derives from 5.6% higher finance income and an 11.2% decrease in the cost of off-balance sheet funds. Further, the cost-income ratio has improved 2.2 pp to 60.63%, assisted by the 7.83% reduction in operating expenses as a result of optimising the commercial network, the digital transformation, the write-down of intangible assets, and the 3.8% increase in recurring gross income to €892 million. The quality of the balance sheet has improved further as the volume of problem assets has shrank, especially of non-performing loans, which are down 26.8% or €902 million. This has resulted in a 2.9 pp reduction in the NPL ratio to 7.63%. Moreover, factoring in debt forgiveness in the foreclosure procedure and the impact of IFRS 9, the NPA coverage ratio is up 1.9 pp at 48.31%. The major drive to sell off non-performing assets has cut the volume of gross foreclosed assets by 10% off the back of 19.3% more sales, most notably thanks to the efforts of the branch network and the sale of the Galeón portfolio in June, comprising almost €300 million of NPAs, foreclosed assets and write-offs. 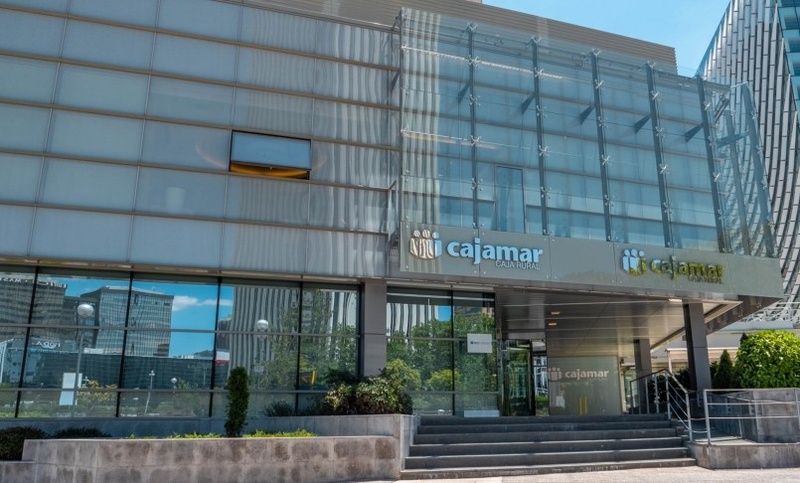 Grupo Cajamar has made further progress in shoring up its solvency and liquidity, particularly the total capital ratio (phase-in), which is up 1.52 pp at 14.25%, after applying IFRS 9 on 1 January 2018. The 7.8% increase in eligible capital and reduction in RWAs also contributed to this. The CET1 ratio, which reflects the highest quality capital, was also up at 12.52% (phase-in) and 11.54% (fully loaded), easily fulfilling the SREP requirements imposed by the SSM. The Group also enjoys a comfortable level of wholesale funding and unfettered access to the wholesale markets, considerable capacity to generate liquid assets and a healthy liquidity position. It complies with the limits imposed by the European Banking Authority, with maturities covered over the coming years. A major mortgage-covered bonds issue of €500 million was also placed in 2018, along with the IM BCC Capital 1 securitisation of €972 million at the end of the year, both of which have helped improve solvency. The liquidity coverage ratio (LCR) stands at 207.49 % and the net stable funding ratio (NSFR), at 118.51 %, with regulatory limits sitting above 100%. The loyalty of Grupo Cajamar’s customers continues to grow, with 1.5 million customers considered to be loyal at year-end 2018 – 44% of the total. Of these loyal customers, some 47% (428,000) are digital customers, which is 9% higher year-on-year. Fully digital users – of the Grupo Cajamar app – also total 159,000, with a 57% increase from a year earlier. Another example of the loyalty of the customer base is the success of the 360º bank account, which has been opened by 164,000 customers. There has been a 55% rise in users and 48% growth in turnover year-on-year. The strategy of putting the experience of its 3.4million customers at the centre of its business and boosting value propositions for them through the 5,506 professionals,1,018 branches and 1,516 ATMs, as well as through the Group’s online banking and mobile banking channels is continuing to be extremely well received. Thanks to all this, Grupo Cajamar ranks sixth for customer satisfaction in the “Stiga Q4 Customer Satisfaction Survey”, achieving a decent score above the sector average. It sits in third place in terms of customers’ satisfaction with their advisors and eighth for satisfaction with telephone banking. Throughout 2018, Grupo Cajamar opened six new branches: four in Aragón (Barbastro, Calatayud, Ejea de los Caballeros and Fraga), one in Carmona (Andalusia), and another in Mutxamel (Valencia). It also continues to provide a service through mobile branches, avoiding cases of financial exclusion, to thirty small towns and villages in Almería, Alicante, Valencia and Castellón.These branches attended over 21,500 people during the year, covering upwards of 61,200 kilometres. In accordance with its unique cooperative banking business, Grupo Cooperativo Cajamar maintains its commitment to businesses, especially to growing and developing the agri-food sector, championing and carrying out knowledge transfer and research projects in which it works closely with public bodies and research centres, technology companies and agri-food companies. Also during 2018, business events were held in several Spanish cities (Madrid, Valladolid, Burgos, León, Salamanca, Valencia, Alicante, Castellón, Barcelona, Lérida, Murcia, Málaga, Almería, Sevilla, Córdoba, Granada, Jaén, Palma de Mallorca, Las Palmas de Gran Canaria, Santa Cruz de Tenerife and Barcelona) using a variety of formats to contribute to fostering an entrepreneurial culture. Furthermore, we ran our own programmes of responsible banking and responsible finance, and partnered on initiatives to encourage development-related dialogue and other cultural and sporting activities. Grupo Cajamar’s laboratories also welcomed a total of 3,249 visitors during 2018, and its researchers and technicians organised 103 knowledge transfer events attended by 9,164 people. Five new publications were also published during the year, the most noteworthy being: Volume 31 of Mediterráneo Económico collection focusing on “Bioeconomy and sustainable development”; the monographs entitled “The pig sector: from uncertainty to leadership” and “The governance of Spanish agri-food cooperative societies: benchmark models and business cases”; and the “First-half 2018 ANICE-Cajamar Barometer on the Spanish meat industry”. Workshops on the future sustainability of agri-food: a total of 10 events throughout 2018 attracting 2,200 people. They comprised: the Experts Forum on Healthy Eating (Madrid, 16-19 April); the Outlook for Spanish Agriculture in 2050 Forum (Madrid, 25 April), the Symposium on Organic Farming (Almería, 16 and 17 May); the CAP After 2020 Sector Forum (Madrid, 18 May); the Second International Conference on Bioeconomics (Barcelona, 14 June); the presentation of the Report on the Spanish Agri-food Sector (Madrid, 4 July); the Almería Seminar: Smart Farming + Artificial Intelligence (Almería, 3 October); the Forum on Biostimulants and Biofertilisers (Valencia, 14 and 15 November); the Incyde School Forum on Entrepreneurship for the Future (Almería, 21 November); and the presentation of the Analysis of Almería’s Fruit and Vegetable Harvest, 2017/2018 (Almería, 13 December). Cajamar Agri-food School, with six training programmes: The Futuro Programme for young agri-food entrepreneurs, aimed at training young agri-food entrepreneurs in business management techniques that will enhance their competitive capabilities and growth potential; the Lidera Programme for senior managers of agri-food companies, aimed at strengthening the leadership capacity of Spanish agri-food companies to meet the challenges of a changing, globalised and digital world; the Supera Programme for executive managers of agri-food companies, aimed at updating their management knowledge to include the most innovative management trends; the Oportunidad Programme for Governing Boards of agri-food cooperatives, aimed at giving the members of the Governing Boards of agri-food cooperatives management insights that will help them improve the competitiveness of their cooperatives; the Innova Programme, aimed at fostering business innovation through the sharing of innovative agri-food-related experiences in the rural environment among professionals, business owners and entrepreneurs, so as to help reinforce the sector’s productive capacity, giving innovation a vital role in meeting the present and future challenges facing the rural economy; and the Continúa Programme, aimed at updating innovative knowledge in the business community, so as to foster creative management of business challenges, promoting team work in applying innovation in decision making and the performance of important tasks. Creation of a High-Tech Incubator for businesses in the field of sustainable usage and management of water resources, to help convert innovative ideas related with water and how it is used and exploited into products and services that will generate knowledge, wealth and employment. This project receives economic support from the ERDF Funds through the INCYDE Foundation and will be carried out over a five-year period.